Negie Fallis from his Facebook page. 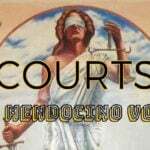 MENDOCINO CO., 10/01/18 — Both Negie Fallis and Antonia Bautista-Dalson appeared in Mendocino Superior Court on Tuesday, September 25, and both are scheduled to be back in court on October 5, to hear whether they will be tried together on charges of possessing a firearm while a felon. 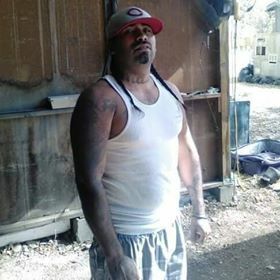 Fallis is a convicted felon and is accused being a felon in possession of a firearm. Fallis is to be tried on those charges on October 15, and Bautista-Dalson, with whom he has been romantically linked, has been charged as an accomplice. Both are currently out on bail. Fallis is the prime suspect in the disappearance of Khadijah Britton, a missing Covelo woman, and the firearm possession charge stems from an arrest made in relation to the search for Britton. During the search Fallis was arrested on a warrant for allegedly beating of Britton, which is when the firearm was allegedly found. During court proceedings last week, Mendocino County District Attorney David Eyster stated that he is petitioning the court to have the two defendants tried together, since both charges stem from an incident in which Bautista-Dalson allegedly aided Fallis’ in the crime of possessing the of a firearm. Both attorneys for the defendants noted they would oppose this, and presiding judge, Cindee Mayfield, has scheduled a hearing for October 5 to decide on the matter. Both defendants have pled not guilty and are out on bail, and both were present at the proceedings, sitting next to each other with a few supporters present. Many members of Khadijah Britton’s family were also in attendance, sitting on the opposite side of the aisle. The charges against Fallis and Bautista-Dalson stem from his arrest for a January incident in which he is suspected to have violently beaten Khadijah Britton, who has been missing since February 7. During his arrest for the alleged incident involving Britton, Fallis is also alleged to have hidden two firearms at a house in Covelo. Prosecutors claim that Bautista-Dalson assisted Fallis with the firearms. During his preliminary hearing, witnesses for the prosecution testified to hearing the two discuss the firearms over the phone while Fallis was imprisoned. Britton, who like Fallis and Bautista-Dalson is from Covelo, was also romantically involved with Fallis, and he remains the primary suspect in her disappearance. Her family and friends have sat through many of his court appearances, often wearing hoodies and pins with Britton’s face the word “hope.” The charges against Fallis for the alleged January beating have been dropped, as Britton was the primary witness, and no charges have been brought related to her disappearance. At one point as Britton’s family and friends as well as Fallis and Bautista-Dalson were waiting in the courtroom for their proceedings to take place, the D.A. gestured to Britton’s mother, Connie Hostler, and went outside the courtroom to speak with her. When Hostler returned, she sat down next to another family member and whispered briefly. She was then told to be quiet by a woman who works in the courtroom, who’s exact job was unclear. Hostler briefly responded that she had spoken to the DA, and then briefly turned back to the woman next to her. Within seconds the court worker turned around and ordered Hostler to leave the courtroom until her case was called, and Hostler waited outside the courtroom for the next hour. The Mendocino County Sheriffs Office continues to seek any information related to Britton’s disappearance, and her family is offering a $50,000 reward for any information that helps find her. MCSO deputies and search and rescue volunteers recently conducted another search, on September 15 in the Covelo area for anything that might help locate the missing woman. Community members continue to highlight her disappearance through billboards, and at events such as the Rise for Climate March in San Francisco. During the recent 2018 California Indian Days parade in Covelo, Britton’s family members rode behind a riderless horse holding a banner featuring a photograph of the missing woman. Anyone with information about Britton should contact the MCSO tip line at (707) 463- 4086 or the tip line (707) 234-2100. You can read The Mendocino Voice’s complete coverage of Britton’s disappearance and Fallis' legal proceedings here. When I was unfortunate enough to finally be able to get an idea of these two people’s entire energy I was surprised by his to hold characteristics of a socially debilitating expectation of rejection. guilt. Very good to be able to take note of with my own two eyes. Although I have waited many weeks to witness this it still caught me off guard. I don’t know who is able to see or not see this, but I couldn’t even justifiably swallow the disgraceful nonchalance of the female’s demeanor especially. It sent me into a state of disbelief so large that i think they could honestly feel the tension and they left the public area in which this took place. Whether or not they were even aware of my presence in the crowd. To the family it’s something that should be advised ive done this for MANY years. Never have i read a person based on the energy they themselves emit, incorrectly. The female would seem to me to greatly display an ironic almost akward amount of the opposite. She seemed uphased, proud or boastful even. She seemed to not share in his level of caution. Not because she don’t share in his guilt but because she’s young and less aware of the way her giddiness and unguarded comments even under her breath appear to expose her. Start with her shes the weak link. I hope im not the only one that can see that this girls role in the grand scheme of things is quite possibly much larger to you than might at first glance see.